In model one, the core sales team maintains ownership of all sales (or “commercial”) aspects of the relationship. The Account Executive (AE) that closed the initial – new logo – sale continues to collaborate with the CSM throughout the relationship and owns any expansion opportunities and the renewal. The CSM manages the day-to-day relationship and is primarily responsible for driving value for the customer and broad adoption of your product. If the right collaboration is fostered, the CSM should be the best expansion lead gen source for the AE, surfacing many opportunities from her assigned customer base. Benefits: For enterprise SaaS with complex solutions, gnarly negotiations and large price tags, you’ll want to go with model one, keeping your core sales team involved and owning all sales transactions (new logos, expansion and renewals). Enterprise-level Account Executives have mastered the art of sales negotiations, tactics and strategies. These AEs can successfully navigate procurement processes, RFPs, CxO negotiations , and extremely competitive situations. CSMs certainly play a collaborative role in identifying new expansion opportunities and ensuring the customer will renew, but the AE leads all sales/expansion/renewals discussions and negotiations, and closes the deals. Dave Blake, ClientSuccess Founder and CEO: "At Omniture and Adobe, we leveraged this model and it worked very well. Our CSMs partnered closely with the AEs to surface expansion opportunities and tee up the renewals, and our AEs negotiated and closed those opportunities successfully. Our clients clearly understood the respective roles and responsibilities and appreciated having two advocates representing them within our company." In model two, the customer success team is not only responsible for driving value and adoption, but they also own all expansion opportunities and renewals. The sales team is focused primarily on new logo sales and may get credit for any expansion within a period of time (first quarter, 6 months, year), but they transition out after that period of time and the customer success team takes over from there and only draws on the sales team as needed for complex expansion deals or renewals. 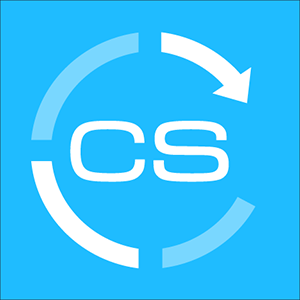 Benefits: If your product, pricing and sales processes are fairly straightforward and simple, you may consider just having the CSMs own expansion and renewals. This model will allow your AEs to focus on net new logos and CSMs can easily handle expansion and renewals. We’re currently using this model at ClientSuccess and have found it very successful so far. Our product and pricing is very simple (a strategically deliberate decision) and so are our expansion and renewal discussions, so this model works great for us. 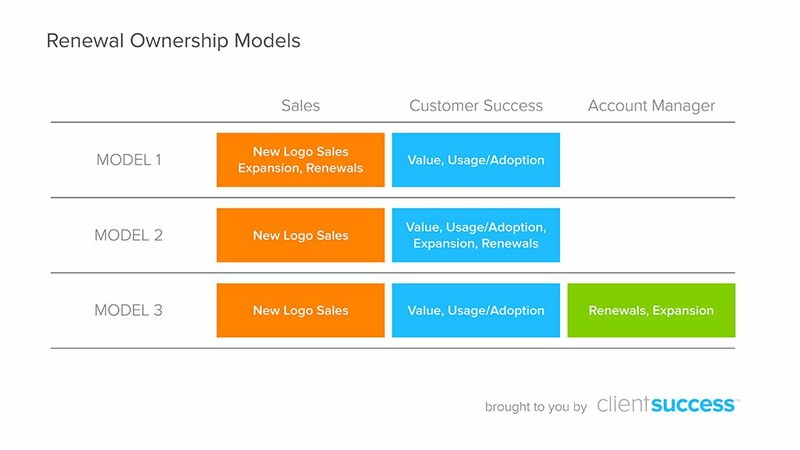 In model three, the core sales team handles all *new* logo sales, the customer success team drives value and adoption, and a separate customer sales team owns expansion and renewals for the *existing* customer base. I’ve seen several titles associated with this role – Account Manager (AM), Renewals Specialist, Customer Account Executive, Client Executive, etc. Benefits: If you are an Enterprise SaaS company and you feel your sales team spends too much time focused on expansion and renewals and not enough time closing net new logos, you may want to split the team into a new logo sales team and client sales (or Account Management) team. This will ensure the focus on driving net new logos while also focusing additional experienced sales reps on managing expansion opportunities and renewals. We generally don’t like the third model. The old saying “two is company, but three’s a crowd” seems to ring true for most customers. From our experience, customers prefer to only deal with one or two primary contacts. In this case, a primary sales contact (AE) and a primary post-sales contact (CSM). Adding a third person (AM) to handle expansion and renewals can cause additional confusion on roles and responsibilities and requires the customer to develop a new relationship of trust beyond the original AE and the CSM. We prefer to keep things simple for customers and reduce the primary contacts to one or two. So, which renewal ownership model is best for your company? It depends on the complexity of your sale and the experience-level of your CSM team. As you explore these scenarios within your company, adopt the model that best fits your product set, sales complexity and team experience. Regardless of the model you choose, remember to simplify the experience and clearly define roles and responsibilities for the customer. Doing so will align to your customer’s needs and drive high expansion revenue and successful renewals.